“In order to comprehend the beauty of a Japanese garden, it is necessary to understand — or at least to learn to understand — the beauty of stones. Not of stones quarried by the hand of man, but of stones shaped by nature only. Until you can feel, and keenly feel, that stones have character, that stones have tones and values, the whole artistic meaning of a Japanese garden cannot be revealed to you. Not only is every stone chosen with a view to its particular expressiveness of form, but every stone in the garden or about the premises has its separate and individual name, indicating its purpose or its decorative duty.” – Lafcadio Hearn (1850-1904), a noted writer on Japan, said this about Japanese rock gardens. 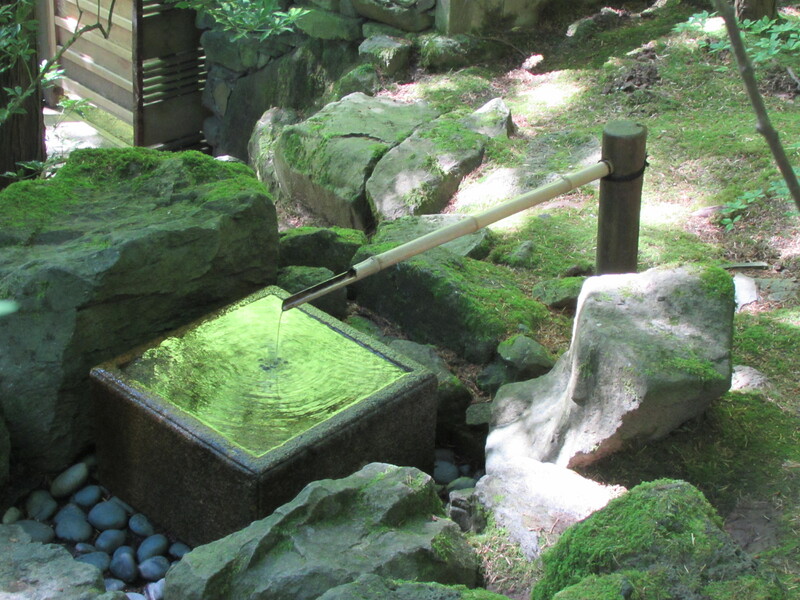 The style and tradition of Japanese garden design evolved over hundred years. It was influenced by culture and religion, especially from China. Ultimately it became unique to Japan. Japan’s first religion was Shinto, the reverence of nature symbolized in the garden in the form of rocks, water and trees. The Japanese practice Shinto as a way of life and a religion that believes in harmony between the divine, humans, and nature. Zen Buddhism came to Japan and the concepts of simplicity, austerity and contemplation became reflected in Japanese gardens. The way the garden is tended has its own culture and practice which focuses on harmony and peace. In Japanese gardens, every element from nature has a sacred side. 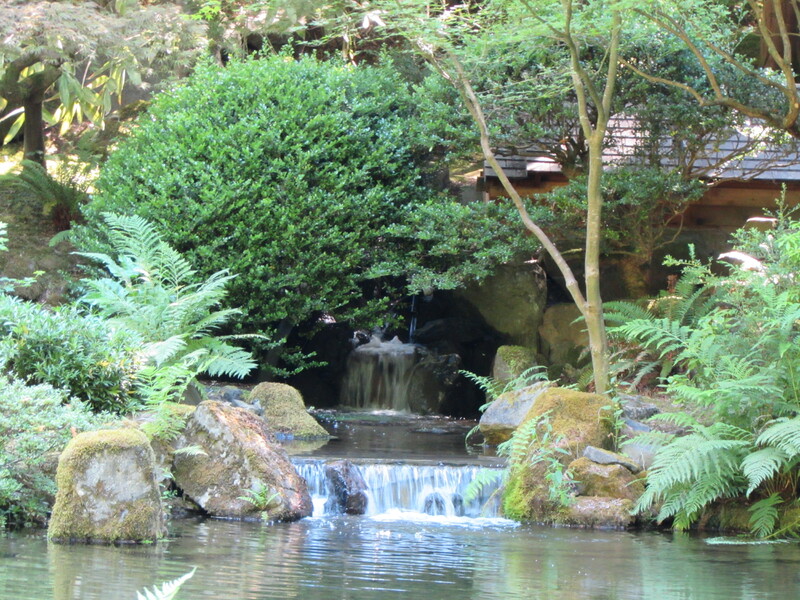 When I was at the Portland Japanese Gardens a docent pointed out the Turtle and the Crane in the pond near the waterfall. I was curious what they symbolize knowing there is a meaning and intention to every element in a Japanese gardens. Tsuru the crane and Kame the turtle are the symbols for youth and long life (or immortality) and found within Japanese garden designs from earliest times in the form of rocks and islands.The crane is a sacred bird that’s said to live 1,000 years and if it lives 2,000 years it turns black. The turtle or tortoise is said to live 10,000 years. It is one of four celestial guardians (dragon, phoenix, tiger and turtle) of Chinese mythology. 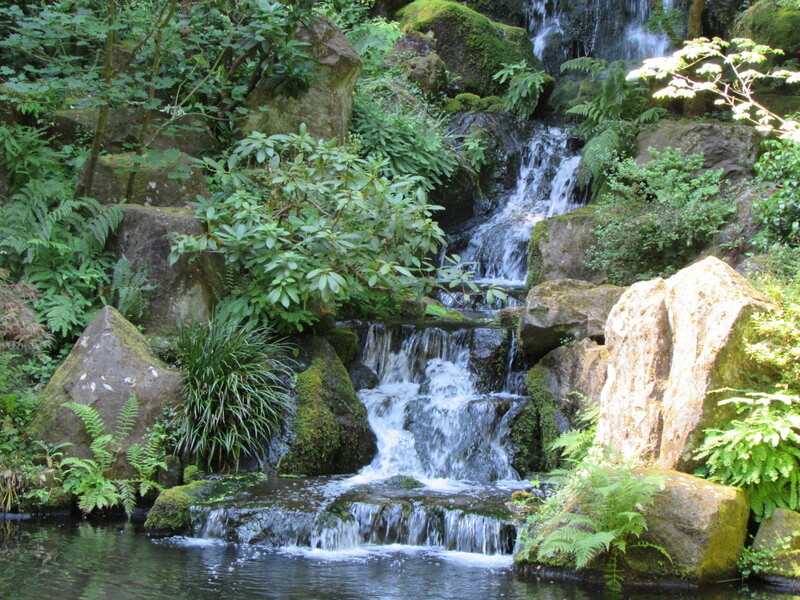 In a Japanese garden there is always the element of water. This can be represented by a real pond or gravel pond. The rocks in a pond symbolize islands. They serve as focal points and help give perspective. It is best to place them near a shore and not in the middle of the pond. 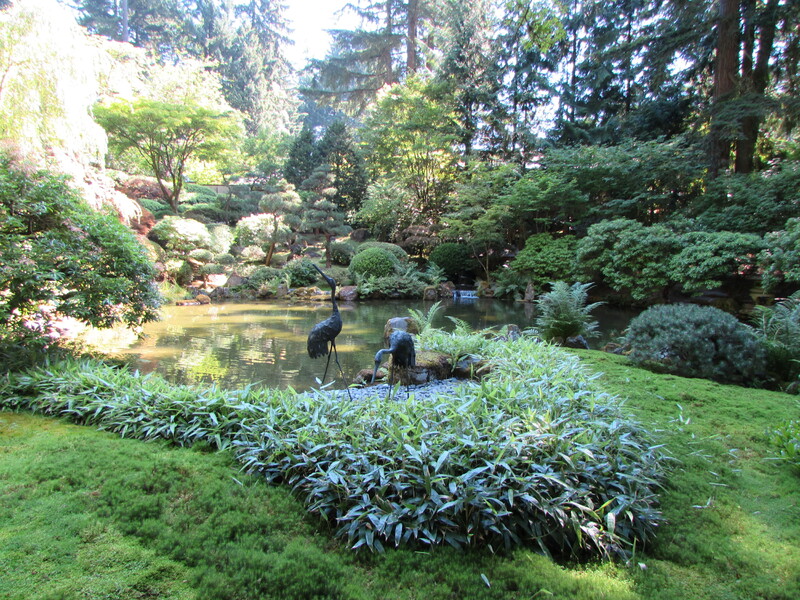 You will find Crane and turtle islands in most Japanese gardens. To make a crane you use an upright rock to symbolize the wings, it is okay to use one rock for this. You may put a low lying rock next to it to symbolize the head and neck as if the crane is flying. For a turtle island you need a head rock and smaller rocks for the feet and tail. Or you can have on large mound rock that represents the turtle shell. I have been fortunate this year to visit the Portland Japanese Garden in both winter and summer. I feel a calm wash over me as I walk along the paths. I feel such a sense of ones with nature there. I met a woman sitting on a bench that said she use to live in Portland and would come here after work to recover from the hectic day. I have been studying the art of Japanese Gardens for several years. My two favorite books are Creating Japanese Gardens by Philip Cave and Landscape Gardening in Japan by Josiah Conder. I am drawn to the philosophy and reverence for nature and I let this influence my designs. Thanks for the background. I noticed the rocks much more at the Chinese garden, maybe because the Japanese ones blended so much better with the garden, rather than being show pieces. Beautiful photos! You are welcome. My husband is studying rock placement and really enjoys picking out big mossy boulders for our installs. I love the organic shapes and see them as sculptures and also like the way they anchor a space. What a wonderful Japanese garden . It looks very authentic. I love the Lafcadio Hearn quote. Not many people seem to read him now. I have his book: Two years in the French West Indies . It has a wonderful description of life in Martinique- ‘The Island of Flowers.’ Perhaps I should read his book about Japan too. Portland has an amazing climate and the Japanese garden there has a large group of volunteers and staff that keep it up beautifully. That reminds me of our version of Mexican food that you will never find in Mexico. I am going to look into those books! Agh! Thank you for pointing that out! It is kind of funny too! 🙂 Happens to the best of us! I too hope to return and take a few hours of sanctuary again! I very much love Japanese gardens and because the meaning is so complex in all the elements, I never tried designing one without the knowing and understanding. I would have loved to visit the garden in Portland. It looks peaceful and very tranquil. One of my favorite gardens on the tour, I knew little of the fascinating information you’ve included here. Wonderful images too!